The MinierAcustica Music camp is now taking bookings for its 2015 event which will feature Russ Barenberg, Wesley Corbett and Eden Macadam-somer as instructors. The camp takes place in the countryside outside of Urbino in central Italy and, as can be seen in more detail on their website, the week includes classes, concerts and other cultural activities.The MinierAcustica website is multi-lingual and French and Italian versions can be accessed via a drop-down menu at the bottom of the page on their website. MinierAcustica run two camps on two different weeks and the 'Russ Barenberg' week is the 'Blue Week'. To see full details of the week including the schedule, pricing etc. 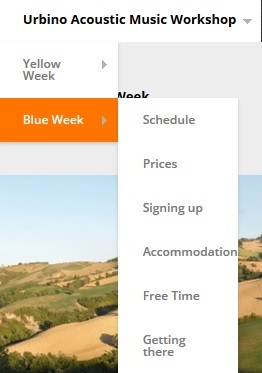 highlight the Blue Week menu to access the relevant pages (as shown below). Finally, here is a video from the concert ont he final night of MinierAcustica 2013.